Posted on May 28, 2018 Posted in General Article	. Even if an air cooler is energy efficient, plays a significant role in maintaining the quality of the environment, does not contribute to ozone layer depletion and uses a natural resource like the water to run, there are enough challenges in running an air cooler. If an air cooler has to be installed in the home one needs to take care that these challenges are handled properly. Unclean cooling pads can produce bad odor and smell. Using the honey comb pad or the aspen material is a good alternate to counter this problem. Standing and stagnant water in the water tank has been found to be good breeding ground for mosquitoes. With the recent outbreak of dengue and other carrier based diseases in the country, the government and other health related bodies keep announcing from time to time to clear the water from unused air coolers. It is advisable always to clear out standing water from the tank once in a while and run the fan of the air cooler without water to dry the pads as well as the air cooler interior and then refill water again. Running an air cooler requires a source of water nearby like a tap. Care should be taken to install the room cooler onto a window that is near to the source of water. With a desert cooler this is anyway not a big issue as the desert cooler is portable and it can be wheeled near the source of water without much problem. There are hundreds of models available in the market that claim to be efficient air coolers. Remember for all electrical machines, it is important to check the safety specifications. For an air cooler it becomes more important because it contains water too. Water and electricity is a bad combination if proper electrical insulations are not provided by the manufacturer. Read the manual carefully for features like proper earthing facilities, short circuits, shock proof body and more before buying the product. One also needs to be aware of fake and duplicate products in the market that try to attract customers by providing really low cooler price. One way to beat this problem is to buy an air cooler from a trusted online retailer. Firstly, these e-shops feature non-branded local product too but they make sure that the product deliverables are as per specifications. Secondly, the star ratings and honest feedback from other customers of the same product that you are planning to buy helps in understanding the true worth of the product. 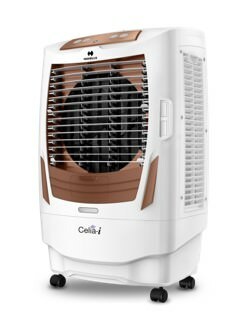 The best air coolers in India need not surely be the one that is priced high or belong to one of the major brands. Surely, buying an air cooler from a well-known manufacturer is a way of being guaranteed that the product will be safe, consistent and genuine because of the brand value of the company. Having said this, some of the local brands are also good too and they generally sell at lower cooler price but one needs to thoroughly read the features and the technical specs before deciding. « What Colour Should You Paint Your Bedroom Walls?